As you think about next year, how many filing cabinets do you want taking up valuable office space? How much staff time do you want wasted searching for documents? How many documents do you want misfiled or lost? 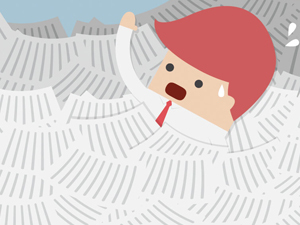 If you’d like the answer to be “much less” or “none,” then you’ll want to consider having your documents scanned and implementing a document management system to make them instantly available. This guide will help you identify budgeting guidelines to go paperless in 2015 and when to expect a positive ROI. Once you have these numbers, a document scanning provider will be able to estimate the cost to scan them. Tip: An experienced and high quality scanning company will want to see your documents before providing an estimate. They may also recommend not scanning all of your documents but only the most critical ones. The good news: the cost of both document scanning and document management software has never been more affordable. This is especially true when you send out your documents to be scanned by an experienced document scanning company, and when you use cloud document management – both options become predictable and affordable monthly expenses. Once you have even just a ballpark estimate of these costs, it will quickly become apparent what it’s costing you to do nothing. From our experience, the payback period is often less than a year, with a positive ROI often being realized in just a few months. And keep in mind this ROI is in addition to benefits from efficiency gains, quicker and easier audits, meeting regulatory requirements, achieving business continuity in the event of a disaster, ability for employees to work remotely, and mobile access to documents.